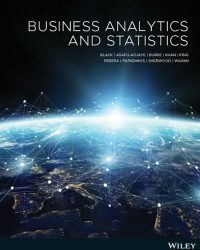 Written for the Australian and New Zealand markets, the first edition of Business Analytics and Statistics, 1st edition (Black et al.) presents statistics in a cutting-edge interactive digital format that’s designed to teach you to make informed business decisions based on statistical data analysis. You can expect components like expert insight videos from business practitioners that highlight the relevance of statistics in business with real-world local cases, animations and interactivities that are embedded at the point of learning to bring course concepts to life, refreshed resources from WileyPLUS, our homework and assessment tool that delivers drill-and-skill practice, Concept Check questions embedded throughout the text that provide instant feedback and reinforce the concepts you’re learning about in the text, and ensuring students get to have the best of both worlds, with the ability to switch between reading something tangible and studying with online (or offline!) learning resources, through the ability to search, highlight and take notes within the text for more efficient study. Practitioner videos provide insights into the application of statistical concepts. Excel screen captures walk students through the steps involved in solving statistical problems using Excel. Animated demonstration problems model how to solve a range of statistical problems. Stepped tutorials allow students to work through problems step-by-step. Interactive case studies allow students to apply their recent learnings to real-world scenarios. Revision sets at the end of each chapter help students to understand their strengths and weaknesses by providing immediate feedback.